I missed the Beacon Bonfire this year. Daughter and son-in-law were arriving imminently and I thought it inhospitable to expect them to let themselves into an empty house. However just at 6.30, I was reminded of that scene from Close Encounters, you know, the bit where everyone is assembled in the arena, full of expectation and suddenly the sky is full of lights and flashes. But Parracombe and Martinhoe folk are a stoical bunch and didn’t let a little bit of thunder and lightning dampen the proceedings. Uda reports; “The Beacon Bonfire Party on 2nd August was not a washout despite the lashing rain…but went down a storm…! Rain battered the tents and the people…but what did it matter? Our feet got very wet but the music was great; the maypole dancing was incredible; skittles, welly wanging, darts, so many games to keep us amused… the hog roast, the beer and the cakes were superb; and the massive bonfire warmed our hearts and bodies. A massive £1000 was raised after all expenses paid, which will go to the School and both Village Halls (Martinhoe and Parracombe). THANK YOU to all those who made this event happen!! We really could not have done it without you ALL”. Mark and Debbie Harding at Sunnyside Farm, have launched a new project, ‘Learning through adventure’ for school children and other groups to visit and meet the animals. Their 25 acre farm borders the River Heddon and they have alpacas, cows, sheep, pigs, horses, ducks, chickens, geese, dogs, cats, guinea pigs and a rabbit! Visits are available for all, individuals or groups, and there is no age or ability limit. They are registered with Devon County Council for health and safety and are currently offering free farm visits for schools. Leaflets and teacher’s packs are available on request. To find out more or to book a visit call Mark and Debbie, 01598763241 or email d.harding616@btinternet.com. 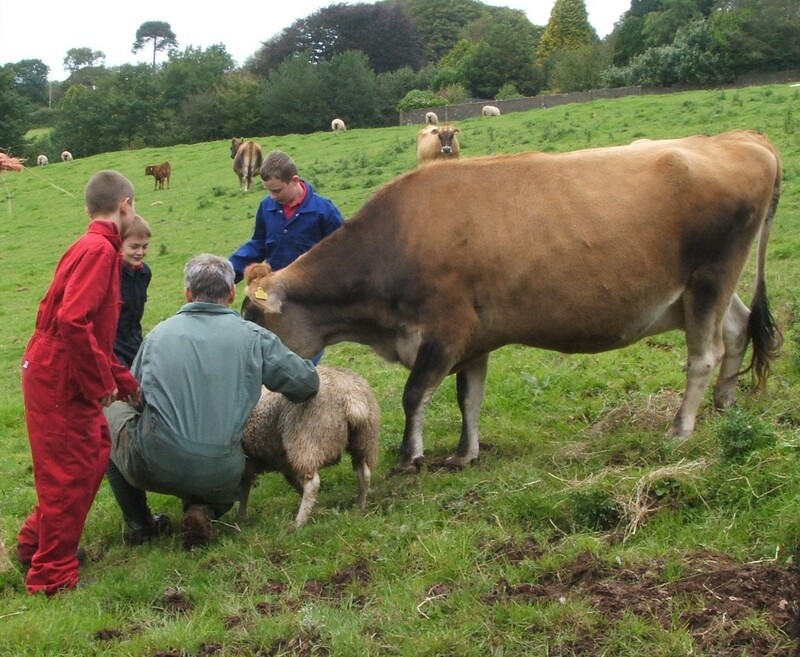 In this month’s picture, some youngsters have a close encounter with Mark, a sheep and Maple the jersey cow. Now a report from the Wednesday Craft Group sent in by Carol. “We meet every second Wednesday of every month, from 2-5pm at the RAOB Parracombe Village Hall, to exchange ideas, share patterns and recipes and enjoy a cuppa and a slice of delicious home made cake. We have recently been able to support local charities, including The North Devon Hospice, The National Samaritans Walk, Burrow House Residential Care Home, as well as The Fish & Chip Babies out in Africa. We have also supplied knitted blankets and hats for the Barnstaple Premature Baby Unit. We welcome new ideas and projects to inspire us and are always very happy to see new faces, so please come and share a very pleasant afternoon with us. You are assured of a very warm welcome. I would just like to add a huge thank-you to Kevin and Val for organising last month’s event which provided us with Val’s, sumptuous cream tea and a very informative talk on the A – Z of pottery by Kevin, a very experienced and accomplished potter. An enjoyable time was had by us all. A collection of £40 was raised at this event in aid of Parracombe School. My grandfather used to read the Western Morning News and would often point out articles that he thought might be of interest to me. Occasionally there would be a special feature on weather or climate and I was curious about the references to Buchan’s Warm periods. Buchan was a Scottish scientist who lived in the late nineteenth century and by observation over a long period thought he had identified patterns in the weather with either especially warm or cold periods at predicable intervals. The most recent Buchan Warm period was 12th – 15th August, but I don’t think it was noticeably warm. 1st September is St Giles Day when an old country saying is “fair for the 1st, fair for the month”. A more useful day of prediction is the 29th, Michaelmas or St Michael’s Day. This is a quarter day when the wind direction predicts the trend for the next three months. Bill Tanton, a farmer from Torrington used to make predictions on the quarter days, and though not foolproof, there did seem to be some credibility in the system. 21st September is the equinox after which the hours of darkness will be greater than those of light. Certainly this summer has been kinder than last as born out by the rainfall figures from Mary and Bill. Rainfall for July was only 28 mms or 1.12 inches compared to July 2012 when we recorded 208mms which is 8.32inches. And that seems to be all for now. A reminder that the Harvest Festival this year at Christ Church, running for three days from Friday 11th October will include a celebration of farming in Parracombe. There is still time to look any farming memorabilia, old photographs, farm records, show rosettes, etc and offer them to the organisers, best to contact Linda Tansley or June Aiken. See you all here next month.